When I reached Wawa I turned west to travel along the main route of the Trans-Canada Highway, which in Ontario runs along the north shore of Lake Superior and is designated as Hwy 17. West of Wawa, near Marathon, I followed a small access road off the main highway to look for a place to camp. 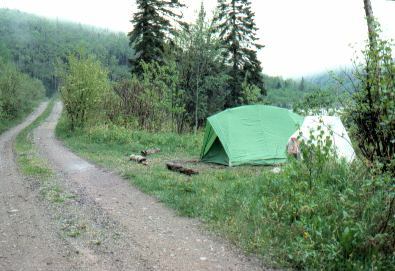 Shown here is a fairly typical camping spot on this trip - often just a spot off the road somewhere. It was very cold and wet the next morning. Here is a view out my tent door, looking across the small lake I was camped on. My tent was nice in that both the door and window could be kept almost wide open even in the rain. These are icicles near my campsite that morning -- on June 9th!! Needless to say, I didn't leave right away that morning. I wanted to wait for the day to warm up a bit, so I took a hike up to the end of the small access road I was camped on. It led to the top of a high nearby hill where a microwave communications tower was located, giving an awesome far-ranging view for miles around. By the time I came back down I was ready to leave. 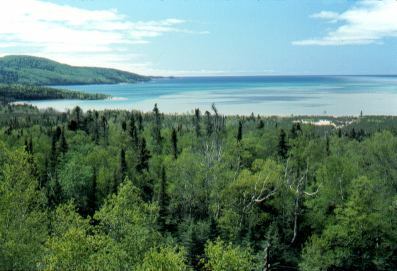 Later as I rode west it cleared off, and beautiful panoramas of Lake Superior opened up beside me as I rode west. This picture is past Coldwell (aptly named, I thought!). 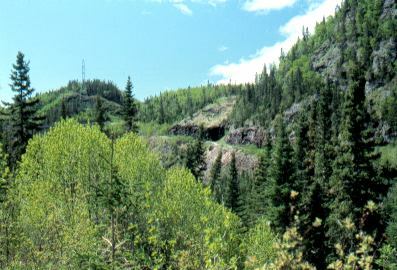 This is part of the Little Pic River valley. It's still late spring here at the beginning of June, as can be seen by the leaves that are not yet fully out.